Hedge funds posted a strong rebound in February with the Eurekahedge Hedge Fund Index up 1.79%1 as underlying markets rallied with the MSCI World Index gaining 3.87%2 during the month. 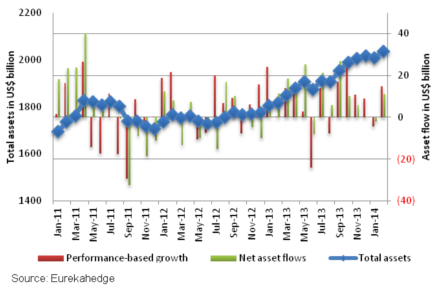 Final asset flow figures for January revealed that managers incurred performance-based losses of US$4.5 billion while recording net asset outflows of US$1.7 billion as hedge funds got off to a rough start in 2014. Preliminary data for February shows that managers have posted performance-based gains of US$14.8 billion while net asset inflows stand at US$11.0 billion, bringing the current assets under management (AUM) of the industry to US$2.03 trillion – the highest level on record. Hedge funds posted their best performance in the last 12 months, up 1.79% with fund managers delivering performance-based gains of US$15 billion and recording net asset inflows of US$11 billion during the month, bringing the current AUM of the global hedge fund industry to US$2.03 trillion - a new record high. Long/short equities hedge funds recorded their 15th consecutive month of positive net asset flows, with net capital allocations to the strategy for 2014 standing at US$19.0 billion. Trend following strategies posted their ninth consecutive month of net asset outflows in February, and saw redemptions worth US$12.7 billion over this period.